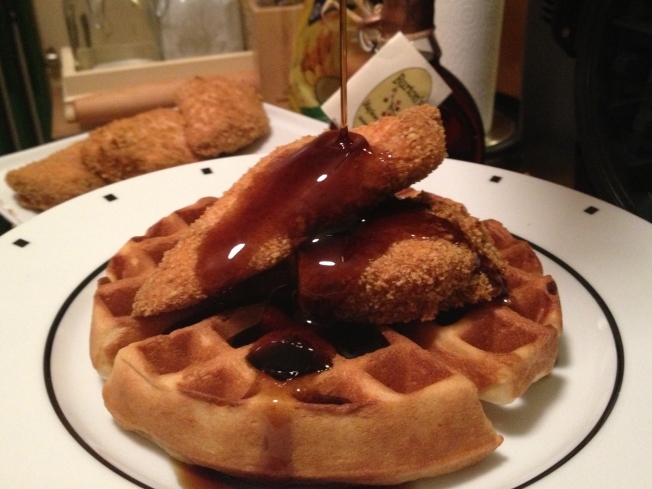 Chicken and waffles are not a popular here as they are in the south, but they should be. This dish combines the savory flavors of crunchy boneless chicken with crispy, but tender, waffles, all drenched in pure maple syrup. This is breakfast comfort food, though it's actually great for any meal of the day. It's also traditionally made with friend chicken. But, I bake my chicken with a crispy bread crumb coating instead because I don't do a lot of frying in my kitchen. This recipe yields three large waffles and 1 1/2 pounds of chicken. Depending on your appetite, that will feed from 3 to 6 folks. If you're feeding 6, that means half a waffle each. However, you can certainly double the waffle recipe below if you'd like each guest to have a whole one. Wayne shows you how to roll up a game day favorite. 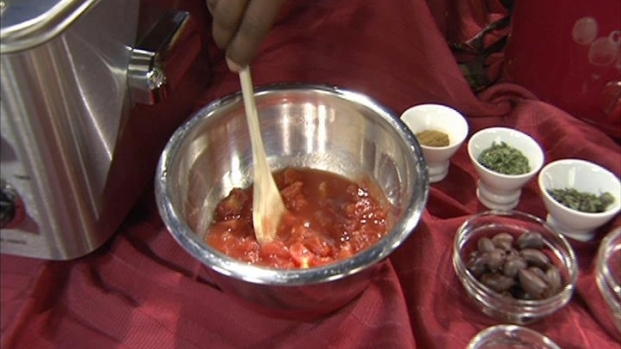 Wayne shows you how to bring the flavors of the Mediterranean to your kitchen. Mix together 2 tablespoons of maple syrup, 2 tablespoons of brown sugar and 1 tablespoon of bourbon in a large bowl. Rinse chicken and pat dry with paper towels. Place chicken in the bowl with the marinade and toss to coat. Cover and refrigerate for 30 minutes. Preheat oven to 400 degrees F. Place the panko crumbs in a disposable bag and flatten them a bit with a rolling pin (or bottom of a can) so they are finer mixture and less coarse. Prepare coating mix by combining bread crumbs, crushed bouillon, paprika, pepper, garlic powder, oregano, onion powder and olive oil in a large bowl. Remove chicken from refrigerator. 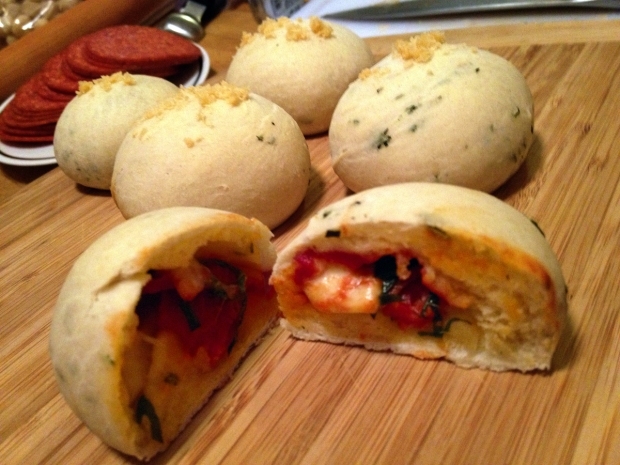 Let excess liquid drain off each piece and roll it in the bread crumb mixture to coat thoroughly. Place on a foil lined baking sheet. Take any remaining crumbs and press them into the tops of chicken pieces on the baking sheet. Bake for 30-35 minutes or until golden brown and internal temperature reaches 165 degrees F.
While chicken is baking, prepare waffles. Mix together flours, brown sugar, baking powder and salt in a large bowl. Stir together, eggs, milk, butter and syrup in a small bowl. Slowly pour wet mixture into the dry ingredients and stir to combine thoroughly. Make waffles according to the directions on your waffle iron. *This recipe makes three 7" waffles with my waffle iron. If you're serving 6 people, and you'd like a whole waffle for each, then double the recipe. Remove chicken from the oven when it is done and let it rest for about 5 minutes. Slice large pieces in half and top each waffle with an appropriate serving size. Serve with butter and maple syrup.